There are almost 12 millin inhabitants in Ecuador. 6 million of them live in poverty. Of these, 60% are children under 18 years old. About 19,500 children live on the streets, about 5,000 of them in Quito. According to World Bank figures, about 1.5 million people in Ecuador are destitute, and a further 2.5 million earn below the minimum wage. Without education, support or life chances, Ecuador’s children who live in poverty are left stranded. Development aid is able to support some of them, but this often results in financial dependence on foreign countries. Sintaxis Foundation has an extensive network through its partner projects. When we are approached for help, we build up partnerships with projects to meet specific local needs. Most donations are made by companies or private individuals. Our contribution to the social aid programs is to make the link between donors and partner projects and to ensure that funds are invested according to donors’ requirements. In addition, we offer our students the opportunity to do voluntary work. The work can last for between 2 weeks and 1 year. Sintaxis has just started a project together with the school of Rickenbach / LU in Switzerland. Claudia and Olaf Huber gave us the opportunity to say a view words about our humanitarian work. The collection at the marriage was dedicated for our projects in Ecuador. The money collection led to an amount of 904 Swiss Francs. At the moment Sintaxis is looking for further donations to be able to start at the end of the year or at the beginning of 2008 a new project which will be supported by these donations. The Sintaxis Foundation is collecting money for new projects. 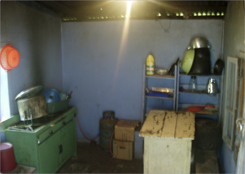 We work with differnt schools in Ecuador, and this project began in May 2008. Because of the high inflation the project costs will be about 30% higher than expected. Sintaxis is negotiating possible solutions with the government. We think we will accomplish this project soon. The first pictures of the workings as well as comparisons of the school before we started and after we started the workings. Because of the high inflation the project costs will be about 30% higher than expected. Sintaxis is doing everything to accomplish this project as soon as possible. At the moment we are negotiating with the government and we hope to get some governmental assistance. We are happy to tell you that we are going to start the workings on the project "Escuela Chimborazo" on the 26th/27th of May 2008. At the moment we are collection money for the project "Escuela Chimborazo". With donations we pay only the working materials. All the work has to be done bye the parents of the children as voluntary work. Sintaxis only allocates the materials. Sintaxis Foundation has received donations from different companies as well as from the primary school in Enetbürgen (Switzerland) in order to support this project. The scope of the project is to do some renovation work on the school and to install a water connection to the kitchen. 85 kids go to school here and the school only has two classrooms and three teachers available. All work to build the new classrooms and to undertake the renovation of existing classrooms is done voluntarily by the parents and local community. Thanks to the support of several donors, Sintaxis Foundation was able to complete the renovation of the school "Escuela Pululahua". The project started in Autumn 2004 and was finished by the end of 2005. The aim of the project was to renovate the roof and three classrooms in this school which is located in the middle of the Pululahua crater, close to Quito (Ecuador). The project has now been completed. In order to thank all donors, the school has put a huge sign on top of the roof with the names of the donors listed. The following pictures illustrate the different project phases and shows before and after images of the work done. The physical work for the renovation of this school has been done by voluteer parents. The huge danger of structural collapse of the roof was one of the key reasons for Sintaxis to support this project. Thanks to several donors, Sintaxis Foundation was able to support the school financially in order to buy the material required to build a new roof for this building. This image shows how the classroom looks now. The work has been completed. The roof is now secure and the walls have been painted with fresh colours to provide the kids with a better atmosphere in the classrooms.